Epic is an animated fantasy adventure movie based on the book The Leafmen and the Brave Good Bugs by William Joyce. Teenage Mary Katherine comes to stay with her father who is an eccentric scientist who believes there are tiny people in the forest who live in a faster mode where we can’t see them. His life work is based on learning about these tiny forest people but Mary Katherine doesn’t believe they exist, like everyone else in his life, and is trying to convince him to quit his pursuit. In the forest is a world of the people called the leafmen. Queen Tara goes out to choose a flower pod to use to choose the heir to her throne. After choosing the pod, they are attacked by a group called the Boggins who want to destroy the forest and make it desolate. With the pod they can take over the forest. During the chase, Queen Tara gets hurt with an arrow and falls out of the trees. Mary Katherine was in the forest chasing their three legged dog Ozzie and sees the Queen fall. The Queen makes her small and Mary Katherine is given the mission to protect the pod until it can bloom in the full moonlight. Mary Katherine is overwhelmed with her new discovery but once the queen dies she chooses to help the leafman fulfill the Queens request. On her journey, she meets Nod who wants to give up life as a leafman soldier, and Ronin who was in love with the queen. Ronin is one of the leaders and feels responsible for Nod since he lost his father. He wants to see Nod learn about teamwork and become a great soldier. Along the journey, they are also joined by a snail and a slug, Mud and Grub, who help keep the pod alive. Epic is definitely worth watching in 3D. The 3D aspect brings the forest alive. In the beginning of the movie, I was more entranced by the beauty of the forest than the storyline or characters. It’s what draws you into the movie and begins the adventure. 3D also brings out how small the leafmen are and their world compared to ours. The story and characters have a great mix of complexities, interest and fun that it make it a great movie to be enjoyed by the whole family. 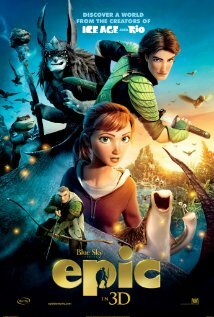 Epic is currently playing at Dinuba Platinum Theatres 6, also in 3D. Showtimes can be found on their website. Platinum Theaters Dinuba 6 now proudly presents digital quality films in 2-D and 3-D with 5.1 Dolby digital surround sound to maximize your movie experience.